One of my clients arrived for a session wearing a delightful and unusual scent; and because it was so subtle I couldn’t figure out which aroma it was. It turned out to be neat vetiver essential oil, (not your basic choice for perfumes I would have thought). When I asked her why she had chosen this scent, she said that her yogi teacher suggested it would help her into a deeper meditative space and that she totally wanted to relax during her massage. Well, the teacher was right in that one of vetiver’s gifts is the ability to access deep tranquility from within. Not only does vetiver encourage total relaxation, it also has wonderful therapeutic qualities. It is considered antiseptic, a sedative for the nervous system, a stimulant for red blood cell production and has a tonic effect on the whole system. Vetiver is steam distilled from the roots and rootlets of the andropogon zizanioides plant, which is a tall perennial grass native to India, Indonesia and Sri Lanka. 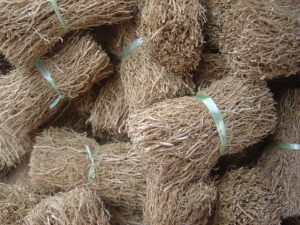 These rootlets are washed, cut up and dried, then soaked in water before distillation. A resinoid can also be produced for use as a fixative in perfumes. In skin care, vetiver balances and dries acne and oily skin. It helps heal wounds and cut/scrapes more effectively with less scarring. When added to a face cream or lotion it revitalizes mature and aging skin and rejuvenates wrinkly, irregular skin textures. Vetiver encourages stimulation of the circulatory system, and therefore aids in relieving the stiffness and pain from arthritis, rheumatism and muscle cramping. Sprains as well as routine aches and pains from muscle overwork or fatigue can be soothed by massaging vetiver in a carrier oil or lotion onto the tender affected site. Massage is probably the best way to ensure a deep sense of relaxation and tranquility when using vetiver. Stress seems to disappear, as does anxiety and tension. This oil seems to have a grounding and stabilizing quality to it, calming that “up-rooted” feeling and centering one more into their body. As mentioned, it is a very sedating oil so would be valuable in a nighttime bath, especially if insomnia was an issue, or if continual worries and negative thoughts nag at the brain when the rest of the world is asleep. Burning the oil in an aroma lamp at bedtime is also an option for peaceful sleep. In meditation, tranquility is the key word. Deep peace and inner sanctity are offered with vetiver, especially when burned with other soporific oils like frankincense and sandalwood. Restful, contemplative states are easily achieved when these oils are included in one’s spiritual discipline.